Vista's SuperFetch and ReadyBoost: How Does it Affect You? Since you're all up to speed on Vista's SideShow feature, it may be time to check out Vista's other new introductions—SuperFetch and ReadyBoost. SuperFetch tracks what kind of apps you use and loads them into RAM so they can be launched faster. 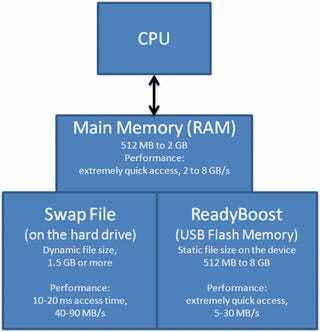 ReadyBoost uses a USB 2.0 flash drive as cache in order to speed up some virtual memory transactions. SuperFetch is a sort of super-cache. If you start and close a certain application multiple times a day, the regular Windows XP cache will make that faster upon subsequent launches. However, if you reboot and if you launch other apps, this caching data is lost. SuperFetch analyzes your behavior over multiple sessions, and if you open, say, your email, browser, and chat in the morning, SuperFetch will load those apps into memory as soon as you start up your PC. Sure, loading more data into the faster RAM from the slower hard drive helps a lot, but the problem with this is that you'll need more "free" RAM in order to take advantage of SuperFetch. Tom's found that 2GB and up gave the best results in caching. ReadyBoost, on the other hand, puts seeks to help out the slow hard drive by caching some data into USB 2.0 flash. By using a ReadyBoost-capable memory stick, you can take advantage of the near-instantaneous seek times on flash drives to get you your data quicker. 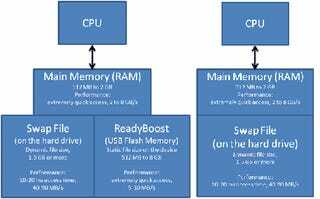 In Tom's Hardware tests, ReadyBoost decreased application launch times dramatically on a low-RAM system when partnered with SuperFetch. SuperFetch knew which apps to load onto the faster USB 2.0 flash drive, which then provided quicker access. The gains when you have a machine with 1GB of RAM diminish, and diminish further when you have 2GB of RAM. However, if you've still got a ReadyBoost-capable drive, you'll still see benefits even on a 2GB machine. 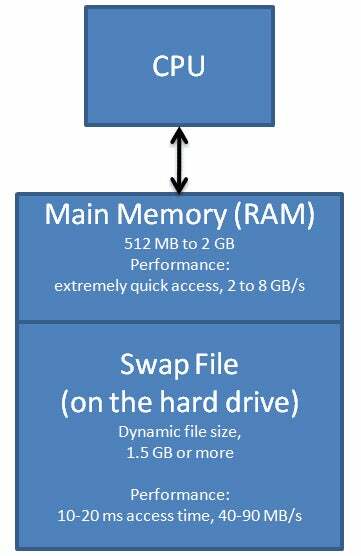 Both of these features tell you that Vista works a lot better when you throw more RAM at it, and Tom's recommends at least 2GB if you're going to take advantage of the caching benefits of SuperFetch.